Last Thursday, Bossy partied with Bossyites in Indianapolis Fishers. It was karaoke and dancing. Like much of life on the blogosphere, I first learned about Bossy at nancynall.com. Bossy’s post about the Vera Wang collection at Kohl’s won my undying loyalty. Her fling with John Cusack is every 40-something woman’s obsession. Bossy is Georgia Getz, a Philadelphia housewife. Nancy Nall Derringer, former columnist for the Fort Wayne News-Sentiniel and current free-lance writer and blogger, refers to Bossy as a far, far hipper great-grandniece thrice removed from Erma Bombeck. Bossy’s on a five-week auto tour, sponsored by Saturn, zigzagging across the country to party with us. Blogging’s changing the face of writing, graphics and televised realty. Bossy and her band of merry women are in the vanguard. Who knew the most creative bloggers would end up being 20-40 something women? The group with no time for themselves, who were supposed to be afraid of computers? This weekend, Obama hit one of Indy’s culiinary jewels, Country Kitchen at the corner of College and 18rh. I watched Martha this week, and she had the best idea for cleaning stainless steel. I know some of you have problems with Martha. Yes, she’s veracity challenged and she has way too much stuff. You might think she got off easy at Camp Cupcake, but that guy who prosecuted her? Eliot Spitzer? He’s scary. Whatever your verdict, the woman knows how to clean. Have you ever seen her with windows? She’s the Michelangelo of window cleaning. A viewer asked her about cleaning stainless steel kitchen appliances, and she whipped out her Windex. She proceeded to spray every square inch of stainless steel on the set. I’ve been wrestling with the stainless steel problem at work and suspected glass cleaner was the solution, but when Martha said it, that was it. This weekend at work, I cleaned about 40 miles of commercial kitchen surface with glass cleaner. That kitchen sparkles. Now I have to follow Martha’s other idea. All I need is one pound of soybeans and some nigari and I’ll have fresh tofu. Everyone’s suffering. Plummeting housing prices threaten our lifelong investment. Job cuts inch nearer and leave fewer options if we lose a job. For others in the world, the economic crisis hits deeper, a world hunger crisis. Bob Sumney Jr. was born January 18, 1956. Oldest child and only son of Alyce and Bob Sumney, Sr., he had two sisters, Robyn and Shelley. Bob’s parents moved their children to a bi-level in Crestview on the northside of Ft. Wayne. Young Bob claimed the neighbohood as his own. Across town, red-haired Janet was born February 16, 1958. The youngest of Bob and Barb Gillie’s four children, her family moved into a tri-level in Westmore Park. Janet conquered the neighborhood and surrounding Times Corners. Bob graduated from Northrop, married, had two children, Shawn and Kelley. Janet graduated from Elmhurst, went to college for a couple years, then flirted with a dead-end job, spending all her money on make-up, jewelry and T-shirts. Fed up, she decided to grow up. She crafted a career, learned finances and bought a dollhouse-sized bungalow on Pleasant Avenue. Things weren’t going well in Bob’s marriage and he and his first wife divorced. Janet dated a series of men-from-hell. Bob’s sister Robyn arranged a blind date. That date was Friday, January 23. 1988. The following Tuesday, Bob asked Janet to marry him. She accepted, on condition he provide proof he was divorced. Janet, a girley-girl when it comes to make-up, expensive jewelry and high heels, has no patience with fluffery. She intended a traditional wedding, but the expense, the trivia and hassle was too much. Instead, she found a dress on clearance, my mon crafted a veil for a vintage hat from the Salvation Army. The wedding took place April 8, 1988. Money saved went toward a downpayment on a bigger house she and Bob needed. The courtship happened so fast, my sister Dana and I didn’t meet Bob until after the wedding service. We walked into Westminster Presbyterian Church on State Street with a cynical attitude. A man recently divorced, with two young children, a work history driving a beer truck followed by selling chewing tobacco, did not bode well for a stable, loving marriage. Besides, Janet didn’t have the best track record. Our concerns vanished at the reception. Even though the couple had known each other less than three months, the two families knew each other for decades. Grandma Sumney was a friend of Grandma Gillie. Bob’s parents went to high school with my dad. My aunt and uncle socialized with Bob’s family since he was a small child. The reception was a wonderful, warm party with delicious food. Fancy appetizers, comfort food, shrimp cocktail, wedding cake you wanted to eat, it had the right amount of alcohol and cheer. Bob and his buddies planned it. Bob fixed up Janet’s little house. They sold it, moved to Pepperwood and had their youngest child, Jessica, December, 1990. Bob loved his children, his home and he loved Janet. Friends say Bob “breathed her.” He not only loved her, he got her. He valued her bossiness, stubborness, energy, and perseverence. He cherished the joy, the comfort and good fortune she brought to his life. As with any marriage, not all was wonderful. Bob’s kids had a hard time incorporating a stepmother into their family equation. Toddler Jessica was high maintenance. One time, Janet packed Bob’s bags for a business trip to Muncie; problem was Bob had just returned from the trip. Work stalled as Lincoln Life shifted operations out of Ft. Wayne. Bank of America offered Janet a position, they packed up and moved to Charlotte, NC. Bob quit his job to become a househusband. Last year, Bob had a sore throat. Doctors diagnosed cancer, and thought they’d caught it early. The surgeon couldn’t remove the entire tumor without Bob losing his voice, so Bob had radiation. Radiation didn’t work, the surgeon removed the tumor and Bob’s larynx. Bob spoke with a vocalizer. Treatment seemed to work for a while, but suddenly cancer spread to Bob’s lungs. Bob signed “no recessitation” paperwork and went home. He was fifty-one years, nine months and six days old when he passed, October 23, 2007. He died at home, Janet and Jessica were with him. Kelley and Shawn came to see him the week before. Janet held a memorial service in North Carolina. Two weeks later, with Jessica, Bob’s niece Lindsay and family, Janet flew to Indianapolis. Kelley and her fiance, Shawn and his family, and Bob and Janet’s friends drove down from Ft. Wayne. On a quiet, Sunday afternoon, we honored Bob and celebrated his life with a dinner at the Rathskeller. Sauerbraten, Hot Wurst Plattes, Kassler Ripchen, Schnitzel, braised red cabbage and German beers were our memorial. It’s never easy to lose a loved one, and Bob died too young and too soon. We do not and cannot forget Bob Sumney. He lives in his children and he lives in Janet. That night twenty years ago, when my sister married Bob, we not only gained a brother-in-law, but a gracious host who knew how to entertain and make his guests feel wanted and comfortable. He gave the best parties, dinners and buffets we’ve ever known. He wasn’t an accomplished cook. A picky eater who refused to touch a green vegetable, he served what his guests liked. When someone overindulged themselves at his bar, he’d steer them to a bedroom to sleep it off, then drove them home after the party ended. He was organized and could set up tables and chairs for 50 in his basement. He collected people and brought them together. One Easter dinner, Janet brought out a heaping platter of Jello Jiggler eggs. We took one look at it and an egg fight broke out on the deck–Mandarin Orange vs. Blueberry. Afterward, Bob quietly pulled out the hose and rinsed down the sugary mess, never complaining that the stains wouldn’t come out of the deck he’d built with his own hards. I swore off the “what do politicians eat” kick I’ve been on lately, then winecanine reports that Hilary’s up in “da’ region” slugging CR’s. Hmm, hummus and Crown Royal? That leads to the next question, What Does Obama Drink? To be fair, we should ask this question of all three candidates, but Republicans love red meat, gin and Rob Roy’s, so we don’t have to worry about what McCain’s drinking. I was in Sahara Mart, looking for harissa, when I found a coffee maker I’ve wanted for a long time.The CM-8A Chemex Coffee Maker. 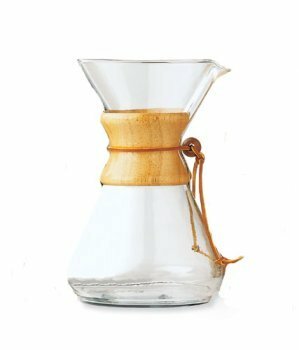 Although it looks Swiss or Scandanavian, and the rawhide string screams macrame/70’s, the Chemex is American and designed in 1941. Long before Harold McGee studied science to confirm or debunk cooking lore, chemist Peter J. Schlumbodm “employed all of the chemically correct methods for brewing” perfect coffee. Today’s Star reviews coffee makers. While Chemex makes the lineup, manual coffee makers are clearly “old school” and dated. Better to spend $900 on an expresso machine that takes up half your counter space. Better yet, stop by Target and pick up a $129.99 single-serve coffee maker . Of course you can’t use just any coffee with this $129.99 machine, you have to use pods. Those will run you an additional $18.99 for four packs. The 6-cup Chemex at Hubbards and Cravens costs $39; mine (the 8-cup version) from Sahara is $31.99. Those dated manual cone coffee filters that everyone knows are out-out-out? Melitta’s new line of Ready, Set, Joe non-electric coffee makers targets the 20-something college set. You can pick up a cone at Marsh for $2.99. The Melitta works with any kind of coffee.